1. Headbox: open-type headbox five sets corresponding to top layer, top lining layer, core layer, bottom lining layer, bottom layer, control and stabilize the sizing press head through the regulation and control of the liquid level inside the headbox. 2. Wire section: five layer corresponding to the top layer, top lining layer,core layer, bottom lining layer, bottom layer. The main components: breast roll , forming board, dewatering board, vacuum box, combined roll, vacuum couch roll, wire-driving roll, wire-guiding roll and frame etc. The top layer, top lining layer, core layer, bottom lining layer, bottom layer , each is with a forming wire. 3. Press section: divided into 1st press, 2st press, 3st press. 1st press and 2st press are large diameter press roll, each equipped with top and bottom each separately one metal roll coated with rubber; 3st press is gloss press, with a stone roll, a metal roll coated with rubber. 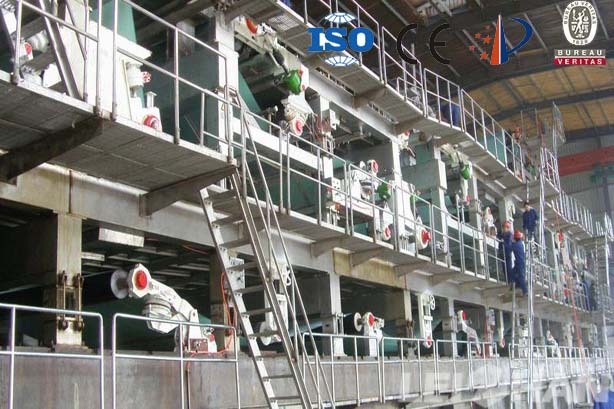 1st press, 2st press are equipped with felt roll and felt suction box, and equipped with top and bottom felt. 1st press, 2st press, 3st press pressurized type is oil hydraulic cylinder pressure. 4. Front drying section: Φ1500 / Φ1800 dryer cylinder, sectional drive, with guide roll, drying wire. Equipped with closed hood. 5. Inclined column surface sizing machine: surface chrome-plated metal roll one piece, metal roll coated with rubber one piece. The surface sizing machine is pressurized by corrugated air tire pressure. 6. Rear drying section: Φ1500 / Φ1800 dryer cylinder, sectional drive, with guide roll, drying wire. Equipped with closed hood. 7. On-line coating: on-line coating is with two sets of front coating head, equipped with sub-section hot air oven and two groups of gloss dryer cylinder. 8. Calender part: double-roll soft calender machine, the upper roll is hard roll (metal roll), the lower roll is soft roll (composite roll), pressurized type is the corrugated air tire pressure. 9. Reeling section: Pneumatic horizontal type, pressurized type is air cylinder pressure.